The Rezound packs a 1620mAh battery – certainly not the largest we’ve seen in an Android device. The battery will have to deal with a dual-core CPU and, most importantly, an HD screen. It surely has a difficult task ahead of it. We kick the test off with talk time endurance. As an LTE handset, the HTC Rezound managed 8 hours and 10 minutes before its battery called it quits – quite a commendable result, we say. 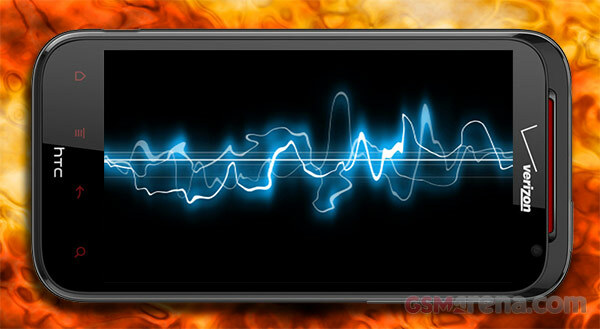 Browsing lifetime is where things begin to toughen up for the HTC Rezound. The device managed 5 hours and 16 minutes. This result puts it in the middle of the pack of devices we’ve tested so far. With 5 hours and 3 minutes of video playback on a full charge, the HTC Rezound posted the lowest result we’ve seen in our test so far. The beautiful HD screen of the device is simply too much for its battery. 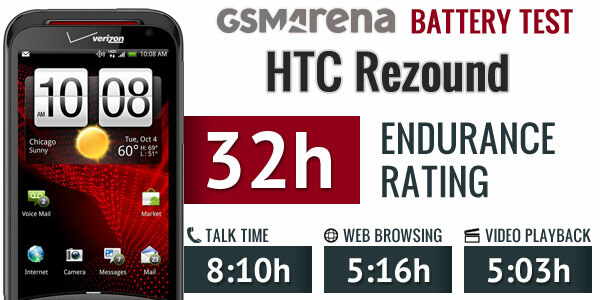 The overall usage of the HTC Rezound is far for impressive – the device managed a score of 32h. This means that if you happen to use it for an hour of phone calls, an hour of web browsing, and an hour of video every day, you will have to charge it every 32 hours. This fairly poor result is mostly attributed to the unimpressive video playback endurance and the far from stellar stand-by efficiency. LTE connectivity might bring unrivaled speeds, but it’s also quite power-hungry. By the way, we will be completing the review of the Rezound shortly, so stick around for more on the HTC flagship.